Colonel (Res) Ronen Cohen is the founder and owner of Inspiration.C.A. Established on January 2012, Insipiration.C.A specializes in characterizing, analyzing and writing ontologies for agencies that deal with counter-terrorism threats and intelligence analysis. 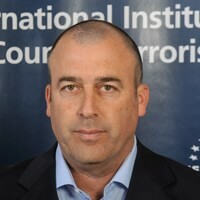 Ronen is an accomplished army veteran, having served as the head of the Terror Arena in the production division of the Intelligence Directorate between the years 2003-2006. Then after, he was assigned as the Deputy Head of production division of the Intelligence Directorate up to 2007, during which he enrolled at Haifa University and received his MA in Political Science and Security. He is also the graduate of the “Barak - Command and Headquarters College” where he graduated with honors to receive his BA. From 2008-2010 Ronen was the Central Command Intelligence officer for the Israeli Army. This research is concerned with rhetoric of a leader during war, as a tool which can be used both to understand his actions and to make decisions about how to confront him. In the research, the rhetoric used by the leader of Hezbollah organization during the Second Lebanon War will be examined. In this paper, the Second Lebanon War will be used as a case study for the understanding of the development in Nasrallah’s perception of the balance of powers in the Lebanese campaign (July 12th-August 14th 2006), as was heard and seen in his media appearances. Such an insight may also aid decision-making processes, policy management, and activation of the Israeli security system in the future.